(Nanowerk Spotlight) The benefits of new technologies, whether they are new medical treatments, an innovative approach to farming or new ways of generating energy, almost always come with some new risks as well. In the emerging stages of a new technology, experts and the public generally differ in their perceptions of risk. While this might be due to social and demographic factors, it is generally assumed by scientists who conduct risk research that experts' risk assessments are based more strongly on actual or perceived knowledge about a technology than lay people's risk assessments. Nevertheless, whether the risks are real or not, the public perception of an emerging technology will have a major influence on the acceptance of this technology and its commercial success. If the public perception turns negative, potentially beneficial technologies will be severely constrained as is the case for instance with gene technology. It is not surprising that a new study found that, in general, nanoscientists are more optimistic than the public about the potential benefits of nanotechnology. What is surprising though, is that, for some issues related to the environmental and long-term health impacts of nanotechnology, nanoscientists seem to be significantly more concerned than the public. Two large-scale systematic data collections in the U.S. show that the dynamics surrounding risk perceptions of nanotechnology among members of the general public and nanoscientists shape up to be much more complex than for previous emerging technologies such as nuclear energy or food biotechnology. 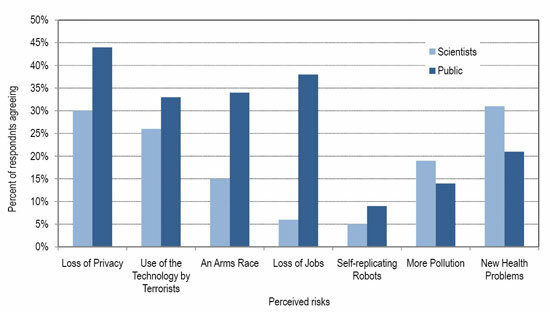 The researchers who conducted these two surveys suggest that historical patterns of the difference between the perceptions of scientists and the general public of risks may be reversed for nanotechnology (interestingly, a study in Europe done last year came to a different conclusion; see "Risks and nanotechnology: the public is more concerned than experts and industry"). Although the two U.S. surveys showed that scientists were generally more optimistic about the benefits and less concerned about the risks of nanotechnology than the general public, scientists expressed more concerns than the general public about two areas of potential risks: more pollution and new health problems as a result of nanotechnology. On the other hand, of more concern to the American public is a potential loss of privacy from tiny new surveillance devices and the loss of more U.S jobs. Those fears were less of a concern for scientists. "Scientists aren't saying there are problems, they're saying, 'we don’t know'; the research hasn't been done." Dr. Dietram Scheufele tells Nanowerk. "However, generally, scientists were more optimistic about the potential for nanotechnology to lead to breakthroughs in medicine, environmental cleanup or national defence." Scheufele, a professor of life sciences communication and journalism at the University of Wisconsin-Madison, is lead author of a report published today in Nature Nanotechnology ("Scientists worry about some risks more than the public"). He notes that this "makes nanotechnology unusual among emerging technologies in that scientists working directly with the technology express stronger concerns about specific potential risk areas than the general public does." The scientists point out that they do not mean to suggest that the public should be more alarmed about environmental or health-related risks associated with nanotechnology than they currently are, or that concerns among scientists are simply an outcome of agenda-building efforts by interest groups. "Rather" says Scheufele, "our findings show a gap in risk perceptions among scientists and the general public that – regardless of its origin – is indicative of serious communication deficits." At the root of the information disconnect, explains Scheufele, who conducted the survey with Dr. Elizabeth Corley at Arizona State University, is that nanotechnology is only now starting to emerge on the nation's policy agenda. Amplifying the problem is that the news media have paid scant attention to nanotechnology and its implications. "In the long run, this information disconnect could undermine public support for federal funding in certain areas of nanotechnology research," says Corley. "Nanotechnology is starting to emerge on the policy agenda, but with the public, it's not on their radar," says Scheufele. "That's where we have the largest communication gap." The researchers collected survey data from both lay individuals and nanotechnology scientists from May to July 2007. Both surveys used questions with identical wording, providing a unique opportunity for systematic comparisons across two large-scale, national data sets. The first data source was a general population telephone survey of 1,015 US adults; the second data source was a mail survey of 363 nanotechnology scientists and engineers. Scheufele explains that by focusing on the most highly cited and most active scientists within the nanotechnology field, "we were able to capture opinions from scientists with an established track record in the field of nanotechnology, rather than from scientists in unrelated disciplines who happened to publish on a nanotechnology-related topic during the timeframe outlined in our sampling frame." While scientists wonder about the health and environmental implications of the new technology, their ability to spark public conversation seems to be limited, Scheufele says: "Scientists tend to treat communication as an afterthought. They're often not working with social scientists, industry or interest groups to build a channel to the public." The good news for scientists, Scheufele explains, is that of all sources of nanotechnology information, they are the most trusted by the public. "I think the public wants to know more. The applications are out there and that concern gap has to be addressed," Scheufele argues. "The climate for having that discourse is perfect. There is definitely a huge opportunity for scientists to communicate with a public who trusts them."